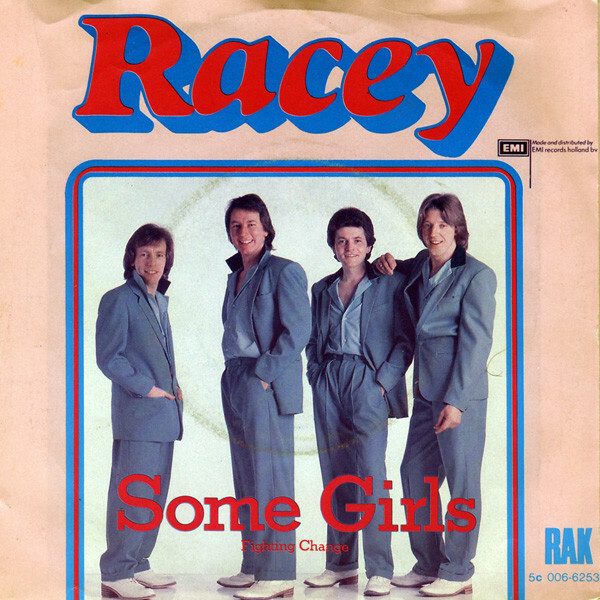 ‘Some Girls’ by Racey spent a second week at number 1 while whoever presented the top 20 at the time (David Gresham I think) would have sounded like a stuck record saying over and over again “and at number 2 it’s Gloria Gaynor’s ‘I Will Survive’” as the song spent a 9th straight week in second place. Amii Stewart’s ‘Knock On Wood’ took the climber of the week award with a 6 place jump from 18 to 12. The only other star rater climb was The Doobie Brothers’ ‘What A Fool Believes’ which moved up 5 from 12 to 7. On the falling front we saw Boney M pick up their 9th biggest faller award as ‘Hooray! Hooray! It’s A Holi-Holiday’ dropped from 13 to 18, a 5 place fall. Frankie Miller’s ‘Darlin’ became the 16th song to spend at least 8 weeks as the oldest in the top 20 as it extended it’s chart run to 19 weeks. There had been 18 songs so far that had made it to 19 weeks in the top 20 but had not gone on to see a 20th week. ‘Darlin’ was looking good to see 20 as it sat at 13 this week. Bill Withers’ ‘Love Is’ became the 13th song to have a chart run of 2 weeks, both of which were spent at 20. This would be the only SA chart action that Bill would see. Also leaving the top 20 was Anne Murray’s ‘You Needed Me’ which lasted 13 weeks and peaked at 5. As with Bill Withers, this would be her only SA chart hit. The first new entry was a 3rd hit for Art Garfunkel in the form of ‘Bright Eyes’. Art overtook his partner from his Simon & Garfunkel days for number of hits as Paul Simon had only seen 2 solo hits so far although both of those had gone to number 1 whereas Art’s best peak so far was 8 (by ‘I Shall Sing’). It had been 177 weeks since Art was last seen on the charts and he was the 103rd act to see a gap of 100 weeks or more between hits. ‘Bright Eyes’ was written by Mike Batt and featured in the 1978 animated film ‘Wateship Down’. It would top the charts in Holland, Ireland and The UK and would be the biggest selling single in the UK in 1979, shifting 1.2 million units. It featured a certain Chris Spedding on guitar whose name Rodriguez fans may recognise as being one of the musicians on ‘After The Fact’ (aka ‘Coming From Reality’) the follow up to Rodriguez’s highly successful (in SA) ‘Cold Fact’ album. The second of the new entries was one of those that you’re not quite sure how to treat for statistical purposes as ‘Magic Carpet Ride’ was listed as being by Buffalo featuring Peter Vee. The question is do you treat this as a collaboration between the 2 acts or a single act as Peter Vee was essentially a member of the band Buffalo. However, as he gets a separate listing on the record label, I have decided to treat it as a collaboration. This meant that Peter Vee became the 38th act to have a gap of 200 weeks or more between hits. His 258 week gap was the tied 23rd biggest overall to date and the 8th biggest for a local act. ‘Magic Carpet Ride’ was a cover of a Steppenwolf hit from 1968. The original hit managed to get to number 3 in the US. In 1995 a band called The Might Dub Katz (which featured Norman Cook who was later better known as Fatboy Slim) recorded a song called ‘Magic Carpet Ride’ which went to 24 in the UK but that wasn’t the same song. Buffalo featured a number of people who had appeared before on our charts as members of other groups. These included Malcolm Watson (Rising Sons), Mike Pilot (Rising Sons, Stingray & Tidal Waves), Glyn Storm (Rising Sons) and Tony Moore (Square Set). Peter Vee was the 17th local act to have clocked up 5 hits so far. Both Supertramp and Eruption celebrated clocking up 20 weeks in the charts this week. Richard Jon Smith made 13th place on the local weeks count list his own as his total moved on to 56, putting 1 ahead of Lauren Copley who dropped to 15th. Hi, I might be wrong, but I don’t think Magic Carpet Ride by Mighty Dubz Cat is a cover of the Stepphenwolf track. Just shared the same title. Pleas keep up the good work, I am an avid follower of this blog and look forward to each weekly installment. You’re quite right Alan. The Mighty Dub Katz song was a different one. Didn’t do my homework properly on this one. I Have corrected the info. Thanks for letting me know.